"Sensible advice for both aspiring writers and word lovers." "Charles Harrington Elster's edgy writing guide . . . lists 350 grammatical mishaps to avoid." Charlie's latest book is a crash course in careful usage. Click here to order a copy now. Answers to "How Accident-Prone Are You?" After the judges verdict, they were neither reticent to discuss the financial debacle at CoproCorp or loathe to accept responsibility for the havoc they'd wrought. The sentence contains six accidents of style: judges should be judge's or judges'; verdict should be ruling or decision; reticent is misused for reluctant; it should be neither . . . nor, not or; loathe should be loath; and havoc is wreaked, not wrought. In what some have called the greatest match in tennis history, Rafael Nadal defeated Roger Federer to win the 2008 Wimbledon championship. When Federer’s final shot failed to clear the net, the elated but exhausted Nadal collapsed on the court. “The conquering Spanish hero” was “lying prone on the grass,” wrote Charles Bricker of the South Florida Sun Sentinel in a syndicated report that appeared—its glaring error intact—in scores of other newspapers across America, including my local fishwrap, The San Diego Union-Tribune, which ran a photo of Nadal lying flat on his back with his arms stretched out. What was the error that slipped by all those yawning copyeditors? The misuse of prone to mean “lying on one’s back.” Prone means “lying facedown, on one’s belly.” The word supine means “lying on one’s back.” Rafael Nadal was supine on the grass of Wimbledon’s center court, but nobody seemed to know it. You could call this confusion of prone with supine a slip, a blunder, or, if you want to be fancy, a solecism. If you want to be fancier still, you could use the precise rhetorical term for it: catachresis (kat-uh-KREE-sis, misuse of one word for another, or using the wrong word for the context). Whatever you want to call it, when a sentence hits an icy patch and skids off the road into a tree, I call it an accident of style. Accidents of style happen when people are merrily writing along and, for one reason or another, fail to observe the rules of the road. Maybe they get distracted and make a wrong turn. Maybe they get too cavalier and lose control. Maybe they’ve forgotten what the operator’s manual says to do, or they never bothered to read it. As the misuse of prone I cited illustrates, accidents of style are not restricted to writing that is hasty or unpolished. They occur in all avenues of communication, from the unsupervised byways of e-mail and blogs to the edited superhighways of newspapers, magazines, and books. In fact, even in the most reputable publications, accidents of style are surprisingly common incidents—not incidences, an erroneous plural of incident and instance that repeatedly runs sentences off the road and into trees. Accidents of style can happen anywhere, anytime (not any time). They can be minor, a fender bender that makes the reader wince for a moment but soldier on, and they can be fatal, a fiery wreck of mangled prose that destroys the writer’s credibility and kills the reader’s patience. 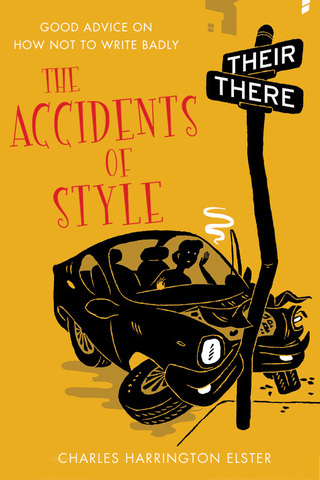 Finally, accidents of style happen to everyone, to the amateur and professional alike—although, as with driving, the experienced writer will have fewer accidents while the apprentice writer will, sadly, have less. So what can you do to insure yourself against these accidents of style and ensure that you are a wreckless—not a reckless—writer? You can learn how not to write badly. But, you may ask, shouldn’t I aspire to write well rather than worry about making mistakes? Shouldn’t I study good writing rather than bad? Of course you should, but if you don’t know enough about what constitutes bad writing, how can you fully appreciate, much less emulate, what is good? Anyone who puts words together for any serious purpose wants to make a favorable impression. And the best way to make a favorable impression, in life as well as in writing, is to know first what makes an unfavorable one. The road to writing well begins with learning how to recognize and correct faulty composition. This book shows you how to steer around the ruts and potholes in that road and safely navigate its hairpin turns. It’s a crash course in careful usage. Whether you write for work, for school, for pleasure, or for publication, The Accidents of Style will help you avoid hundreds of common word hazards and get the most mileage out of your efforts to drive home what you want to say. Copyright © 2010 by Charles Harrington Elster.